The Icelandic SIC report and court cases in Iceland have made it abundantly clear that most of the questionable, and in some cases criminal, deals in the Icelandic banks were executed in their Luxembourg subsidiaries. All this is well known to authorities in Luxembourg who have kindly assisted Icelandic counterparts in obtaining evidence. One story, the Landsbanki Luxembourg equity release loans, still raises many questions, which Luxemburg authorities do their best to ignore in spite of a promised investigation in 2013. Some of these questions relate to the activities of the bank’s liquidator, ranging from consumer protection, the bank’s investment in the bank’s own bonds on behalf of clients and if the bank set up offshore companies for clients without their consent. Landsbanki Iceland went into administration October 7 2008. The next day, Landsbanki Luxembourg was placed into moratorium; liquidation proceedings started 12 December. Over the years, Icelog has raised various issues regarding the Landsbanki Luxembourg equity release loans, mostly sold to elderly people (see here). These issues firstly relate to how the bank handled these loans, both the marketing and the investments involved and secondly, how the liquidator Yvette Hamilius, has handled the Landsbanki Luxembourg estate and the many complaints raised by the equity release clients. A liquidator is an independent agent with great authority to investigate. There is abundant material in Iceland, both from the 2010 Report of the Special Investigative Commission, SIC and Icelandic court cases where almost thirty bankers and others close to the banks have been sentenced to prison. These cases have invariably shown that the most dubious deals were done in the banks’ Luxembourg operations. The Landsbanki Luxembourg equity release clients have another story to tell, both in terms of their contacts with the liquidator and Luxembourg authorities. In May 2012, these clients, who to begin with had each and everyone been struggling individually, had formed an action group and aired their complaints in a press release, questioning Luxembourg’s moral standing and Hamilius’ procedures. The following day, the group got an unexpected answer: Luxembourg State Prosecutor Robert Biever issued a press release. As I mentioned at the time, it was jaw-droppingly remarkable that a State Prosecutor saw it as his remit to address a press release directed at the liquidator of a private company in a case the Prosecutor had not investigated. According to Biever, Hamilius had offered the borrowers “an extremely favourable settlement” but “a small number of borrowers,” unwilling to pay, was behind the action. In 2013 Luxembourg Justice Minister promised an investigation into the Landsbanki products that was already taking “great strides.” So far, no news. In theory, the magic of equity release loans is that by investing around 75% of the loan the dividend will pay off the loan in due course. I have seen calculations of some of the Landsbanki equity release loans that make it doubtful that even with decent investments, the needed level of dividend could have been reached – the cost was simply too high. If something seems too good to be true it generally is. However, this offer came not from a dingy backstreet firm but from a bank regulated and supervised in Luxembourg, a country proud to be the financial centre of Europe. And Landsbanki was not the only bank offering these loans, which interestingly have long ago been banned or greatly limited in other countries. In the UK, equity release loans wrecked havoc and created misery some decades ago, leading to a ban on putting up the borrower’s home as collateral. Having scrutinised the investments made for some of the Landsbanki Luxembourg clients the first striking thing is an absolutely staggering foreign currency risk, also related to the Icelandic króna. Underlying bonds on the foreign entities such as Rabobank and European Investment Bank were nominated in Icelandic króna (see here on Rabobank ISK bond issue Jan. 2008), in addition to the bonds of Kaupthing and Landsbanki, the largest and second largest Icelandic banks at the time. Currencies were bought and sold, again a strategy that will have generated fees for the bank but was of dubious use to the clients. The second thing to notice is the rudderless investment strategy. To begin with the money was in term deposits, i.e. held for a fixed amount of time, which would generate slightly higher interest rates than non-term deposits. Then shares and bonds were bought but there was no apparent strategy except buying and selling, again generating fees for the bank. The equity release clients were normally not keen on risk but the investments were partially high risk. The 2007 and 2008 losses on some accounts I have looked have ranged from 10% to 12%. These were certainly testing years in terms of investment but amid apparently confused investing there was indeed one clear pattern. Having analysed statements of four clients there is a recurring pattern, also confirmed by other clients and a source with close knowledge of the bank’s investments: in 2008 (and earlier) Landsbanki Luxembourg invariably bought Landsbanki bonds as an investment for clients, thus turning the bank’s lending into its own finance vehicle. In addition, it also bought Kaupthing bonds. The 2010 SIC report cites examples of how the banks cooperated to mitigate risk for each other. It is not just in hindsight that buying Landsbanki and Kaupthing bonds as equity release investment was a doomed strategy. Both banks had sky-high risk as shown by their credit default swap, CDS. The CDS are sort of thermometer for banks indicating their health, i.e. how the market estimates their default risk. The CDS spread for both banks had for years been well below 100 points but started to rise ominously in 2007 as the risk of their default was perceived to rise. At the beginning of 2008, the CDS spread for Landsbanki was around 150 points and 300 points for Kaupthing. By summer, Kaupthing’s CDS spread was at staggering 1000 points, then falling to 800 points. Landsbanki topped close to 700 points. The unsustainably high CDS spread for these two banks indicated that the market had little faith in their survival. With these spreads, the banks had little chance of seeking funds from institutional investors (SIC Report, p.19-20). The red lights were blinking and yet, Landsbanki Luxembourg staff kept on steadily buying Landsbanki and Kaupthing bonds on behalf of clients who were clearly risk-averse investors. Loan of €2.1m in January 2008; the loan was split in two, each half converted into Swiss francs and Japanese yens. The first investment, €1.4m, two thirds of the loan,was in LLIF Balanced Fund (in Landsbanki Luxembourg loan documents the term used is Landsbanki Invest. Balanced Fund 1 Cap but in later overviews from the liquidator it is called LLIF Balanced Fund, a fund named in Landsbanki’s Financial Statements 2007 as one of the bank’s investment funds). Already in February 2008 Landsbanki Luxembourg bought Kaupthing bond for this client for €96.000. End of April 2008 €155.000 was invested in Landsbanki bond, days before €796.000 of the LLIF Balanced Fund investment was sold. Late May and end of August Landsbanki bonds were bought, in both cases for around €99.000. In early September 2008 Landsbanki invested $185.000 in Kaupthing bonds for this client. The next day, the bank sold €520.000 in LLIF Balanced Fund. Landsbanki’s investments were focused on the financial sector that in 2008 was showing disastrous results. For client A the bank bought bonds in Nykredit, Rabobank, IBRD and EIB, apparently all denominated in Icelandic króna. In addition, there were shares in Hennes & Maurits, and a Swedish company selling food supplement. A similar pattern can be seen for the other clients: funds were to begin with consistently invested in LLIF Balanced Fund but later sold in favour of Kaupthing and Landsbanki bonds. 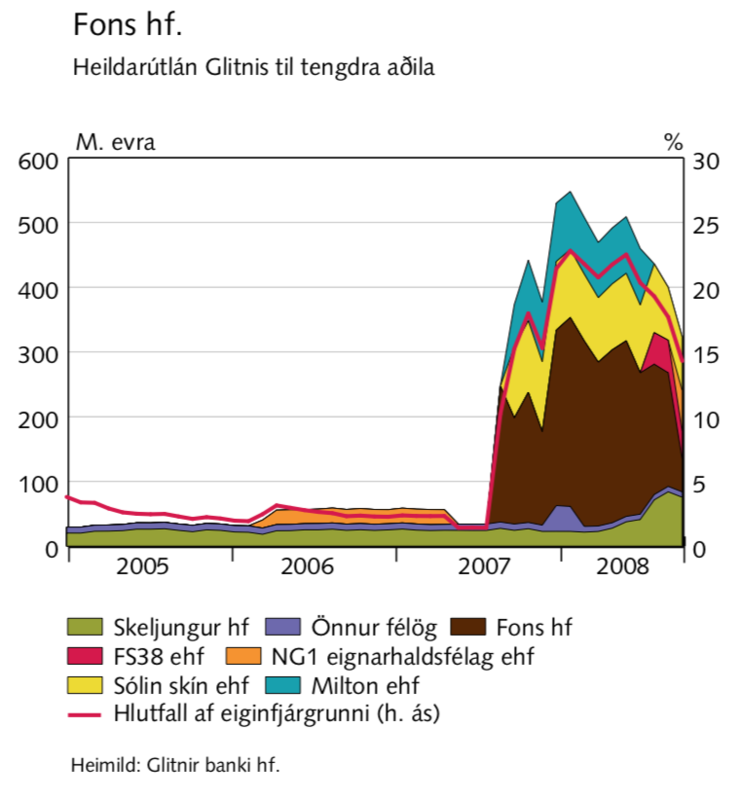 Although investment funds set up by the Icelandic banks were later shown to contain shares in many of the ill-fated holding companies owned by the banks’ largest shareholders – also the banks’ largest borrowers – a balanced fund should have been seen as a safer investment than bonds of banks with sky-high CDS spreads. Landsbanki certainly did not invent equity release loans. These loans have been around for decades. Much like foreign currency, FX, loans, a topic extensively covered by Icelog, they have brought misery to many families, in this case mostly elderly people. FX lending has greatly diminished in Europe, also because banks have been losing in court against FX borrowers for breaking laws on consumer protection. There might actually be a case for considering the equity release loans as FX loans since the loans, taken in euros, were on a regular basis converted into other currencies, as mentioned above. – This is, so far, an unexplored angle of these cases that Luxembourg authorities have refused to consider. Another legal aspect is that the first investments were normally done before the loans had been registered with a notary, as is legally required in France. The European MiFID, Markets in Financial Instruments Directive was implemented in Luxembourg and elsewhere in the EU in 2007. The purpose was to increase investor protection and competition in financial markets. Consequently, Landsbanki Luxembourg was, as other banks in the EU, operating under these rules in 2007. It is safe to say, that the bank was far below the standard expected by the MiFID in informing its clients on the risk of equity release loans. The following paragraph was attached to Landsbanki Luxembourg statements: “In the event of discrepancies or queries, please contact us within 30 days as stipulated in our “General Terms and Conditions.”– However, the bank almost routinely sent notices of trades after the thirty days had passed. It is unclear if the liquidator has paid any attention to these issues but from the communication Hamilius has had with the equity release clients there is nothing to indicate that she has investigated Landsbanki operations compliance with the MiFID. MiFID compliance is even more important given that courts have been turning against equity release lenders in Spain due to lack of consumer protection – and that banks have been losing in courts all over Europe in FX lending cases. The “Panama Papers” revealed that Landsbanki was one of the largest clients of law firm Mossack Fonseca; it was Landsbanki’s go-to firm for setting up offshore companies. Kaupthing, no less diligent in offshoring clients, had its own offshore providers so the leak revealed little regarding Kaupthing’s offshore operations. The prime minister of Iceland Sigmundur Davíð Gunnlaugsson, who together with his wife owned a Mossack Fonseca offshore company, became the main story of the leak and resigned less than 48 hours after the international exposure. In September 2008, a Landsbanki Luxembourg client got an email from the bank with documents related to setting up a Panama company, X. The client was asked to fill in the documents, one of them Power of Attorney for the bank and return them to the bank. The client had never asked for this service and neither signed nor sent anything back. In May 2009, this client got a letter from Hamilius, informing him that the agreement with company X was being terminated since Landsbanki was in liquidation. The client was asked to sign a waiver and a transfer of funds. Attached was an invoice from Mossack Fonseca of $830 for the client to pay. When the client contacted the liquidator’s office in Luxembourg he was told he should not be in possession of these documents and they should either be returned or destroyed. Needless to say, the client kept the documents. Company X is in the Offshoreleak database, shown as being owned by Landsbanki and four unnamed holders of bearer shares. – Widely used in offshore companies, bearer shares are a common way of hiding beneficial ownership. Though not a proof of money laundering, the Financial Action Task Force, FATF, considers bearer shares to be one of the characteristics of money laundering. This shows that Landbanki Luxembourg set up a Panama company in the name of this client although the client did not sign any of the necessary documents needed to set it up. Also, that the liquidator’s office knew of this. (This account is based on the September 2009 email from Landsbanki Luxembourg to the client and a statement from the client). Other clients I have heard from were offered offshore companies but refused. The story of company X only came out because of the information mistakenly sent from the liquidator to the client. Landsbanki Luxembourg clients now wonder if companies were indeed set up in their names, if their funds were sent there and if so, what became of these funds. This has led them to attempt legal action in Luxembourg against the liquidator. Only the liquidator will know if it was a common practice in Landsbank Luxembourg to set up offshore companies without clients’ consent, if money were moved there and if so, what happened to these funds. Invariably, the equity release loans in France and Spain were not sold directly by Landsbanki Luxembourg but through agents. This is another parallel to FX lending characterised by this pattern. According to the Austrian Central Bank this practice increases the FX borrowing risk as agents are paid for each loan and have no incentive to inform the client properly of the risks involved. One of the agents operating in France was a French lady, Philomène Ruberto. In 2011, well after the collapse of Landsbanki, the Landsbanki Luxembourg was putting great pressure on the equity release borrowers to repay the loans. At this time, Ruberto contacted some of the clients in France. Claiming she was herself a victim of the bank, she offered to help the clients repay their loans by brokering a loan through her own offshore company linked to a Swiss bank, Falcon Private Bank, now one of several banks caught up in the Malaysian 1MDB fraud. This case was sent on a prosecutor. 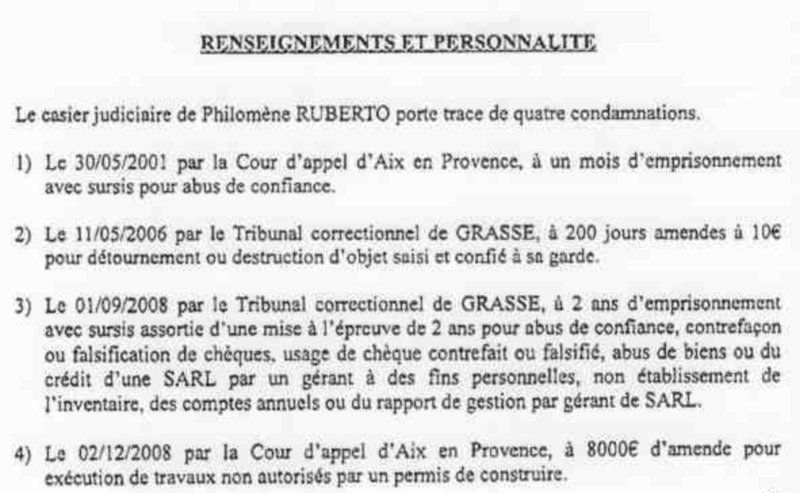 In a penal case in autumn 2014 Ruberto was sentenced by Tribunal Correctionnel de Grasse to 36 months imprisonment, a fine of €15,000 in addition to the around €190,000 she was ordered to pay the civil parties. According to the 2104 judgement Ruberto was, at the time of that case, detained for other causes, indicating that she has been a serial financial fraud offender since 2001. But Ruberto’s relationship with Landsbanki Luxembourg prior to the bank’s collapse has a further intriguing dimension: GD Invest, a company owned by Ruberto and frequently figuring in documents related to her services, was indeed also one of Landsbanki Luxembourg largest borrowers. The SIC Report (p.196) lists Ruberto’s company, GD Invest, as one of the bank’s 20 largest borrowers, with a loan of €5,4m. In 2007, at the time Ruberto was acting as an agent in France for Landsbanki Luxembourg, she not only borrowed considerably funds but, allegedly, on very favourable terms. In March 2007, GD Invest borrowed €2,7m and then further €2.3m in August 2007, in total almost €5,1m. Allegedly, Ruberto invested €3m in properties pledged to Landsbanki but the remaining €2m were a private loan. It is not clear what or if there was a collateral for that part. From 2012, when I first heard from Landsbanki Luxembourg equity release borrowers, inconsistent information from the liquidator has been a consistent complaint. The liquidator had then been, and still is, demanding repayment of sums the clients do not recognise. There are also examples of the liquidator coming up with different figures not only explained by interest rates. The borrowers have been unwilling to pay because there are too many inconsistencies and too many questions unanswered. As mentioned above, Landsbanki Luxembourg was put in suspension of payment, in October 2008 and then into administration in December 2008. As far as is known, people who later took over the liquidation were called on to work at the bank during this time. During this time, many clients were informed that their properties had fallen in value, meaning that the collateral for their loan, the property, was inadequate. Consequently, they should come up with funds. At this time, there was no rational for a drop in property value. This is one of the issues the borrowers have, so far unsuccessfully, tried to raise with the liquidator. Other complaints relate to how much had been drawn. One example is a client who had, by October 2008, in total drawn €200,000. This is the sum this client want to repay. Mid October 2008, after Landsbanki Luxembourg had failed, this client got a letter from a Landsbanki employee stating that close to €550,000, that the client had earlier wanted transferred to a French account, was still “safe” on the Landsbanki account. This amount was never transferred but the liquidator later claimed it had been invested and demanded that the client repay it. The liquidator has taken an adversarial stance towards these clients. The clients complain of lack of transparency, inconsistent information, lack of information and lack of will to meet with them to explain controversies. By late 2009 the liquidator had sold off the investments. This is what liquidators often do: after all, their role is to liquidate assets and pay creditors. However, a liquidator also has the duty to scrutinise activity. That is for example what liquidators of the banks in Iceland have done. A liquidator is not defending the failed company but the interests of creditors, in this case the sole creditor, LBI ehf. Incidentally, the liquidator has not only been adversarial to the clients of Landsbanki but also to staff. In 2011 the European Court of Justice ruled against the liquidator in reference for a preliminary ruling from the Luxembourg Cour du cassation brought by five employees related to termination of contract. Liquidators have great investigative powers. In addition to documents, they can also call in former staff as witnesses to clarify certain acts and deeds. If this had been done systematically the things outlined above would be easy to ascertain such as: is it proper in Luxembourg that a bank systematically invests clients’ funds in the bank’s own bonds? Was the investment strategy sound – or was there even a strategy? Were clients’ funds systematically moved offshore without their knowledge? If so, was that done only to generate fees for the bank or were there some ulterior motives? And have these funds been accounted for? A liquidator can take into account the circumstances of the lending and settle with clients accordingly. And how about informing the State Prosecutor of Landsbanki’s investments on behalf of clients in Landsbanki bonds and the offshoring of clients without their knowledge? But having liquidators in Luxembourg asking probing questions and conducting investigations is possibly not cherished by Luxembourg regulators and prosecutors, given that the country’s phenomenal wealth is partly based on exactly the kind of dirty deals seen in the Icelandic banks in Luxembourg. 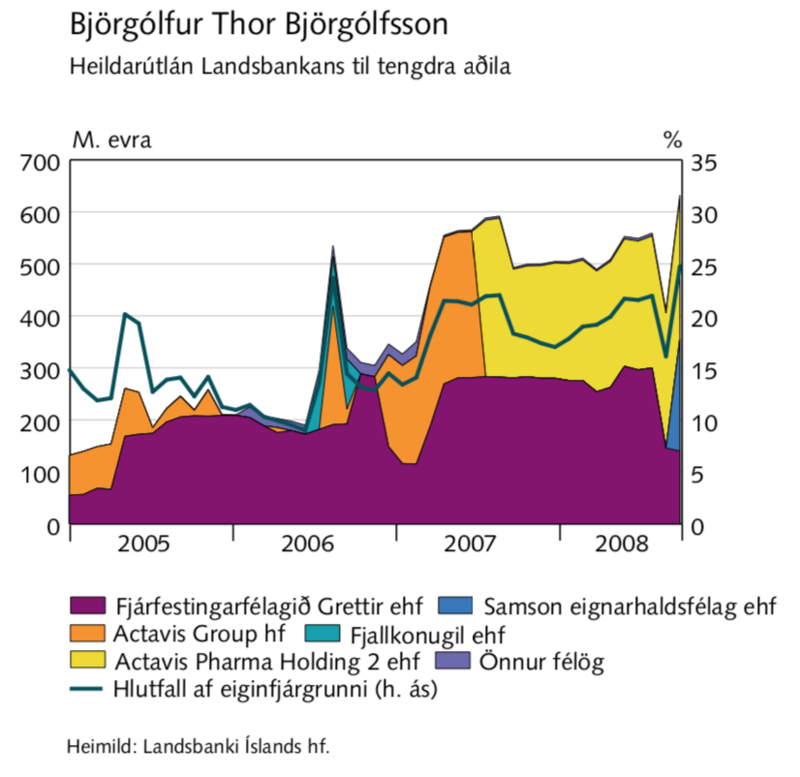 Landsbanki Luxembourg has only one creditor – the LBI ehf, the estate of the old Landsbanki Iceland. According to the LBI 2017 Financial Statements the expected recovery of the Landsbanki Luxembourg amounts to €84,3m, compared to €74,3m estimated last year. The increase is following what LBI sees as a “favourable ruling by the Criminal Court in Paris on 28 August 2017,” i.e. that all those charged were acquitted. It is not the first time I ask this question here on Icelog. In July 2013 there was the news from Luxembourg, according to the Luxembourg paper Wort, that there were two investigations on-going in Luxembourg related to Landsbanki. This surfaced in the Luxembourg parliament as the Justice Minister Octavie Modert responded to a parliamentary question from Serge Wilmes, from the centre right CSV, Luxembourg’s largest party since founded in 1944. Sadly, nothing further has been heard of this investigation. In spring 2016 the Luxembourg financial regulator, Commission de surveillance du secteur financier, CSSF had set up a new office to protect the interests of depositors and investors. This might have been good news, given the tortuous path of the Landsbanki Luxembourg clients to having their case heard in Luxembourg – CSSF has so far been utterly unwilling to consider their case. The person chosen to be in charge is Karin Guillaume, the magistrate who ruled on the Landsbanki Luxembourg liquidation in December 2008. As pointed out in PaperJam, Guillaume has been under a barrage of criticism from the Landsbanki clients due to her handling of their case, which somewhat undermines the no doubt good intentions of the CSSF. From the perspective of the Landsbanki Luxembourg clients, CSSF has chosen a person with a proven track record of ignoring the interests of depositors and investors. So far, Luxembourg authorities have resolutely avoided investigating Landsbanki and the other Icelandic banks. In Iceland almost 30 bankers, also from Landsbanki, and others close to the banks have been sentenced to prison, up to six years in some cases (changes to Icelandic law on imprisonment some years ago mean that those sentenced serve less than half of that time in prison before moving to half-way house and then home; they are however electronically tagged and can’t leave the country until the time of the sentence is over). During the year under review, the CSSF focused heavily on the importance of the professionalism, integrity and transparency of the financial players. It urged banks and investment firms to sign the ICMA Charter of Quality on the private portfolio management, so that clients of these institutions as well as their managers and employees realise that a Luxembourg financial professional cannot participate in doubtful matters, on behalf of its clients. Almost ten years after the collapse of Landsbanki, equity release clients of Landsbanki Luxembourg are still waiting for the promised investigation, wondering why the liquidator is so keen to soldier on for a bank that certainly did participate in doubtful matters. *In court, the French singer Enrico Macias mentioned that all his documents were in English. I found this strange since I had seen documents in French from other clients and knew there was a French documentation available. When I asked Landsbanki Luxembourg clients this pattern emerged. All the clients asked for contracts in their own language. When the non-French clients asked for contracts in English they were told the documentation had to be in French as the contracts were operated in France. Conversely, the French were told that the language was English as it was an English scheme. I have now seen this consistent pattern on documents for the various clients. – Here is a link to all Icelog blogs, going back to 2012, related to the equity release loans. Here is a link to the Landsbanki Luxembourg victims’ website. For some years, Iceland has been the new darling of international tourism, giving the economy a real boost and healthy balance of payment. There are however some worrying signs – overheating is a clear and present risk, never far off in Iceland. The Central Bank warns against compounding risk in tourism and real estate, even more worrying if unhealthy practices in the old banks have not entirely been eradicated in the new ones. In addition, the growing dependence on tourism is, in itself, not entirely a healthy sign, especially as Iceland still lacks clear policy for tourism, which should ideally not be based on ever more tourists but sustainability. “It’s either at ankles or ears” – This Icelandic saying, meaning it’s either too little or too much, certainly fits the Icelandic economy. Navigating the years following the 2008 banking collapse and laying a reasonably sound foundation for the future was done with reasonable success. Lately, tourism is reshaping the Icelandic economy. In addition to classic crisis policies, luck played its part in the relatively speedy recovery – low oil prices, high fish prices in international markets and last but not least, Iceland’s popularity as a tourist destination. Consequently, Iceland has, again, seen booming growth– 7.5% of GDP 2016 and 3.6% 2017 with forecast of 2.9% this year. This time the growth is not leveraged; Icelanders can literally see the cash cows walking around in colourful outdoor clothing: since a few years, tourism, not fishing, is the largest sector in the economy. Though tourism has done miracles for the balance of payment and strengthened the króna to record levels, tourism may not bode much good for young Icelanders. Why did Iceland become such a popular destination? As to the “why” did not entirely materialise out of thin air. Icelandair and later Icelandic tourist authorities have over the years and decades run rather successful campaigns. Posters with glorious photos from Iceland have for example appeared regularly on the walls in London tube stations. The rise in tourism was not as sudden as it might seem – there had been a steady increase since 2003 when the number of tourists were 320.000, then roughly the size of the population, growing by 3.5% to 15.1% a year until a downturn by 1.6% and 1.1% in 2009 and 2010 – though the great increase 2014 to 2016 were indeed staggering. Currency fluctuations have at times made Iceland an expensive destination. That changed for some years after the 2008 banking collapse, making Iceland quite a reasonable destination until around 2014. Luck helped Iceland when it came to international reports of the banking collapse. At the first Greek bailout in 2010, I did some comparison of international reporting of the crisis in the two countries. As in Greece there had been dramatic scenes of demonstrations and some altercations in the centre of the Reykjavík during the winter of 2008 to 2009. But quite remarkably, foreign media would often choose to adorn reports from crash-struck Iceland with glorious landscapes rather than demonstrations, fire and fury. Greece also has spectacular and photogenic nature but the Greek financial crisis seemed more often shown in pictures of violent clashes and aggressive graffiti than alluring landscapes. Far from being the negative impact feared at first, the Eyjafjallajökull eruption in April 2010 proved a gift literally from heaven for Icelandic tourism. An eruption is an awe-inspiring magnificent thing to behold; the Eyjafjallajökull coverage had quite an impact in drawing attention to the island. The Instagram effect has helped. With the rise of Instagram, the popularity of Iceland was bound to rise – the island is a stunning Instagram backdrop. “The experience is that if you have a tourism boom of this magnitude, it is there to stay. There might be some ebb and flow, but tourism will, to my mind, continue to be one of the main pillars of the economy. That means we need to manage it well,” said Már Guðmundsson governor of the CBI in an interview with IMF2017. Common sense dictates that the increase in tourism by 30% to 40% is unlikely to continue but experience from other countries shows that surge in tourism is durable – tourists are not as fickle as fish. According to an IMF study, countries whose travel exports increased by at least 4% of GDP over a decade were likely to see the number of tourists above the pre-surge levels ten years later. 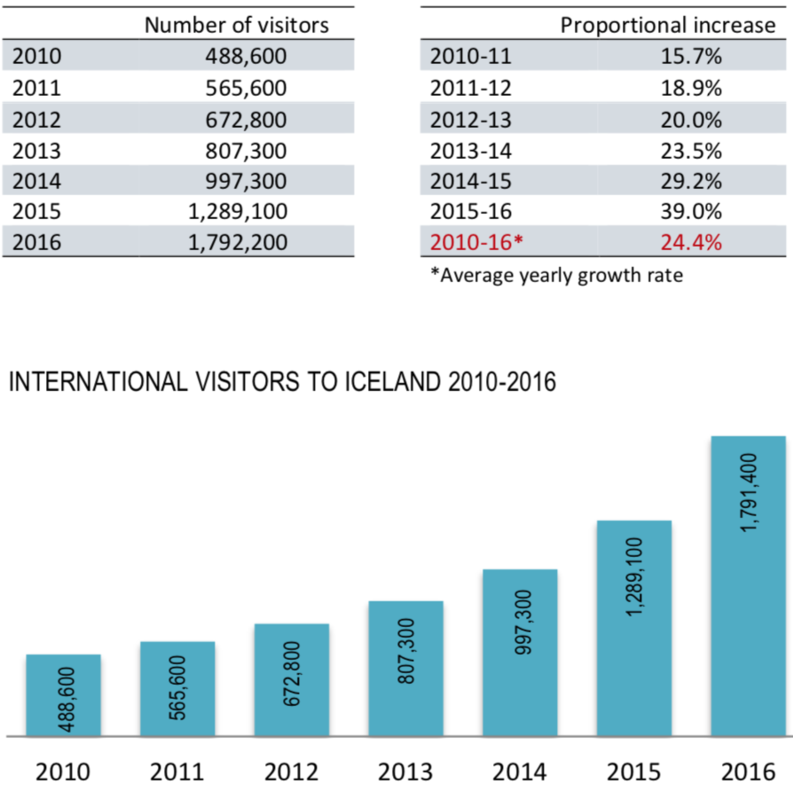 Iceland is a case in point – even the drop in arrivals in 2009 and 2010 did not change the underlying trend. The latest figures show however a dramatic turnaround: the increase the four first months this year was 3.7% compared to last year. The increase was 28.6% 2014 to 2015, 34.7% 2015 to 2016 and a staggering 55.7% 2016 to 2017. The stats do indeed show a decline but all in all still a healthy growth though not the staggering growth of the record years. In countries where the numbers did indeed decline, the causes are most often political turmoil, crumbling infrastructure – and most interestingly if also worryingly, from the Icelandic perspective – overcrowded tourist sites, environmental degradation and loss in price competitiveness. The forecast for this year had been 2.2m but there are already some indications that this figure will be lower, even substantially lower. In addition to overcrowding and environmental degradations, difficult to measure, there is the loss in price competitiveness. With the strong króna Iceland has become the most expensive tourist destination in Europe, even more expensive than Switzerland and Norway. The effect is bordering on the ridiculous: an underwhelming main course at €35 buys in a Reykjavík restaurant doesn’t compare with the quality of a main course at this price in the neighbouring countries. All of this is highly relevant to tourism in Iceland and merits a close scrutiny as it helps to identify the possible weaknesses. All indicators show that tourists go to Iceland to experience nature. Even if they only go for a long weekend in Reykjavík they will almost certainly go on a tour for a day. The fantastic aspect of Iceland is that nature is not distant to urban areas, i.e. Reykjavík; it’s all around, in sight and easily accessed. The island is small, distances short. But there are some indications that overcrowding and faulty infrastructure is starting to detract from the pleasures of visiting the most famous places. Arriving at Þingvellir or Geysir, with these spectacular spots hidden on arrival by dozens of buses and the passengers that spill from them, is not optimal. On the other hand, there are plenty of little known places to be enjoyed in solitude though it may take some research to find them. As both the IMF and the OECD have pointed out in recent reports on Iceland, the varying governments over the last few years have failed to form a coherent policy for tourism in Iceland. The last three governments that came to power – in 2013 Progressives with the Independence party, in 2016 the Independence party with Bright Future and Revival and the present one, 2017 Left Green with Independence party and the Progressives – had all set high goals for tourism in their manifestos. All of them aimed at forming a coherent policy for tourism, including plans to tax the sector in order to fund the necessary infrastructure for sustainable tourism. Nothing, absolutely nothing, has come of these well-intended manifestos – there is no policy and consequently, no plan on which to form a coherent tax policy. Managing the tourism boom, as governor Guðmundsson mentions, is still lacking in Iceland. The danger is that without a policy that aims at building up a quality tourism, fitting the (unavoidably) high prices, tourists will soon shun Iceland because they hear too much of crowded attractions and crumbling infrastructure with the pictures on social media to prove it. With nature like the Icelandic one and high prices, the aim should not be to increase the number of tourists but develop tourism where fewer tourists spend more. This is what Costa Rica and Ireland have successfully done. Again, this requires strategic policies, so far wholly lacking in Iceland. Once upon a time in Iceland, there was little to be gained from lengthy education in order to be a high earner. Being a fisherman on a trawler meant very high salary and owning a large house as can still be seen in small fishing villages around the country. Working as a tradesman could also mean good salary. This is no longer the case. There are fewer trawlers than earlier; a job on a good trawler is harder to come by than a highly paid managerial job. And the construction industry is not providing the same well-paying jobs as earlier. The large construction companies are very different from the small-scale constructor who hired his relatives to work for him. All movements in a small economy like the Icelandic one tend to be rapid. The rise of tourism is no exception. The labour-intensive tourist sector is gobbling up a lot of manpower. The Dutch Disease might be around the corner, especially in an economy where the largest sector is mostly lacking direction and policies. Recently, I have heard a number of Icelandic parents express their worries of what the labour market will offer their children in the coming years. In this rudderless tourist economy, there is no policy to develop other sectors. There is a budding tech sector in Iceland but some of the most successful Icelandic tech entrepreneurs have moved abroad and encouraged others to do the same, for the lack of tech infrastructure in Iceland. There is also a small pharmaceutical sector that could be developed further. But a visionary policy of a diversified economy needs a government with a vision – and that has so far been lacking. The strong economic growth seems to lull Icelandic politicians into complacency. But a country that does not offer its young people the opportunities to seek education and then make use of it at home is not a good place to be. That’s greatly worrying many Icelandic parents. The demographics of Iceland is pretty healthy, it’s a nation of young people, compared to some other European nations. Icelanders are now just over 350.000, the number rises steadily. Except for a few years in the 1960s, 1970s and 1990s and then more recently in 2009, 2010 and 2011, more people enter the country than leave. This looks promising – the nation is growing and more people move to Iceland than leave. However, there is potentially a more worrying underlying trend: in spite of the boom, more Icelanders are leaving Iceland than Icelanders moving home. Foreign nationals are keeping the inflow figures up – more foreigners come to Iceland than leave. After the 2008 banking collapse whole sectors like construction were nearly wiped out, meaning not only the construction workers and tradesmen but also architects and engineers. Icelanders left in droves, both families and individuals, for work abroad. Norway was a particular popular destination as well as Denmark and Sweden. The interesting – and for the Icelandic economy, worrisome – thing is that this flow has not stopped though the figures are lower. Icelanders are still leaving for jobs abroad. This, in addition to the decades-long tradition of young Icelanders seeking education abroad, returning as they graduate. 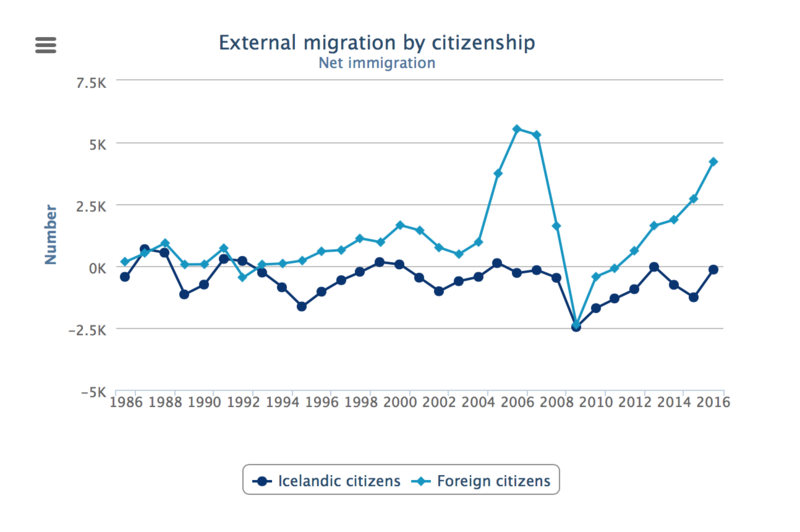 The intriguing fact is that going back as far as the stats show, more Icelanders have been leaving than foreigners immigrating, with over 2.500 foreigners arriving in 2005, 2006 and 2007 – and again since 2015. There is no statistics to show clearly who is leaving but the Icelandic Statistics is working on a more informative registry. Anecdotal evidence indicates that the Icelanders who leave are better educated than the foreigners who immigrate; young people who leave to study look for jobs after studying abroad and do not necessarily return. Also, that it is not just young people leaving but people in mid career. As Icelanders tend to have children early (though not as early as twenty years ago) some might be tempted to leave as the children have left home. One thing that all Icelanders notice when travelling abroad is how expensive food is in Iceland, one good reason to move, in addition to a primitive rental market. More Icelanders living abroad now own property in Iceland as a pied-à-terre. Iceland is well connected to Europe and the US, which does not only facilitate tourism but makes it easier for Icelanders to visit. My sense is that the old tradition of faithfully returning after studying abroad might be changing. In international studies on migration the general reference is that if people do not return after eight years abroad it is unlikely they return. If the Icelandic pattern is indeed changing it might take some time before the statistics capture it clearly. What could be the interaction between tourism and property prices that the CBI is warning against? To a certain degree it comes down to the classic effect of leverage and falling demand. At first sight, the connection between tourism and property prices may not be an obvious one. However, one figure connects the two sectors: 16.5% of working people in Iceland are foreigners, up from just under 6% in 2005. Since 1996, Poles have consistently been the largest number of immigrants each and every year, except in 2004, when they were beaten by Portuguese workers. Consequently, the largest foreign community in Iceland is the Polish one, just under 4% – in total, 8.9% of Icelanders are foreigners, i.e. born abroad. The foreign workers who came in the 1990s mostly came to work in the fishing industry. Later, the construction industry needed foreign workers – building sites in Iceland and London look the same, mostly foreigners from Eastern and Central Europe working there – and now there are the jobs in tourism. The foreigners are, for obvious reasons, more likely to live in rental accomodation than own their home. If there is a real downturn in tourism, the foreigners will most likely be the first to lose their jobs. If there are few or no jobs to go around, the foreigners leave meaning they will leave their rented accommodation. This would most likely cause a downturn in the rental market, largely catered for by few large property companies. A downturn in tourism will to a certain degree affect construction work, with a compounding effect on the rental market. This is how Iceland might be hit by the combined effect of falling number of tourists and falling property prices. In addition, external changes affect foreign workers such as changing circumstances in their countries. Poland is doing better, which might tempt some of the Polish workers to return home. Consequently, one risk to the Icelandic tourism economy is a rupture in flights. The eruption in Eyjafjallajökull was one example of how that might happen. That eruption luckily only caused disruption in flights for a few days. Other scenarios might be different. But man-made havoc may be a cause for greater concern. The two Icelandic airlines, Icelandair and Wow Air carry between 70 and 80% of tourists coming to Iceland; this figure was 73.5%in April. The rest was shared by 13 international airlines with EasyJet having the largest market share among the foreign ones. Are there still “favoured” clients in the Icelandic banks? The CBI risk warning related to the interlinked tourism and property market. A compounding factor is the relative opacity of the privately-held companies, quite large in the context of the Icelandic economy. The question is if any of the unhealthy practices of Icelandic banking pre-collapse can still be found such as the banks having, what I have called, “favoured” clients they serviced in a wholly abnormal way. The Icelandic financial regulator, FME, has recently given noticeto Stefnir, an Arion Bank investment fund, for its risk management: Stefnir had, amongst other things, seven times exceeded its legal investment limits during the year from July 2016 to end of June 2017. The FME notice does not mention what the investments relate to but most likely they are investment in United Silicon, a now failed venture that Arion was highly exposed to. The story of United Silicon is a sorry saga (which I investigated in detail for Rúv) of fraud and greed where Arion played a rather doubtful role as a lender and investor. In addition, pension funds managed by Arion were investors in United Silicon and kept investing well after it was clear that something was seriously wrong in United Silicon. The Arion involvement with United Silicon smacked of how Kaupthing (and the two other large banks, Glitnir and Landsbanki) went out on a limb for their largest shareholders and their fellow travellers: the rule was that the “favoured” clients never lost, only the banks (i.a. by buying assets above market price). That the pension funds lost on United Silicion, is a sad reminder of how the old banks used (or abused) pension funds before the collapse, leading to gigantic losses after the collapse. Given these indications of the return of bad banking, the large privately held and possibly thinly capitalised tourism companies and property companies take on a whole new dimension of risk. The short- and medium-term risk to the Icelandic economy is as the CBI has identified, overheating and the interconnection between tourism and the real estate market. Were this risk to materialise the effect would be nothing like the 2008 collapse, more the classic contraction of the economy Iceland has known for decades where depreciating króna and inflation eat away purchasing power, with rising unemployment (but not necessarily in a dramatic way; the foreigners partly take the hit and leave) and a lower standard of living. To my mind, the no less worrying risk related to tourism is however the Dutch disease and lack of job opportunities for people with higher education or good skills – circumstances, that would cause young Icelanders to move abroad or stay abroad after studying and might also tempt mid-career people to leave. Given that Icelanders who leave are more likely to be better educated than the foreigners who move to Iceland there might already be an on-going brain-drain in Iceland. All of this would in the long run make Iceland less attractive for Icelanders. This risk is growing bigger every year as Icelandic governments seem sadly complacent in forming a long-term policy for tourism – a policy that would develop a high-yield tourism economy and tax it, both to invest in infrastructure and the diversification of the economy. Next October there will be ten years since the banking collapse. Over the comings months I’ll be publishing blogs that in some way reflect on where Iceland is at now. This is the first “10 years on” blog. Sale of Arion – are the Icelandic authorities failing the IMF test? Recent movements around ownership of Arion bank indicate that opacity and under-cover deals are again rife in Iceland, this time with foreigners involved. It could be seen coming: last year, the International Monetary Fund pointed out that an IPO of Arion bank would pose a test for the banking regulator; IMF also stated its worries about a weak regulator, exposed to political pressure, indeed worrying signs. The Arion test is now on-going and so far, it is not obvious that the Icelandic authorities will pass with flying colours. Arion bank was founded on the ruins of old Kaupthing. Until last year, its owners were the Icelandic state, holding 13% and the rest by Kaupthing, the old bank’s estate owned by Kaupthing’s creditors. Kaupthing’s ownership in Arion is through a subsidiary, Kaupskil, set up to create an arm’s length between Kaupthing and Arion. Events over the last year or so do however cast doubt over this exercise: Kaupthing has all the power over Arion it wishes, i.e. in selecting and de-selecting board members. In 2015, some Icelandic pension funds approached Kaupthing and indicated willingness to buy shares in Arion. After talks for over a year, Kaupthing brought the talks to an abrupt end last year. At the same time Kauphing unexpectedly announced four new Arion shareholders: Taconic Capital Advisors, Attestor Capital, Och-Ziff Capital and Goldman Sachs,* respectively holding 9.99%, 10.44%, 6.58% and 2.57%. After these transactions Kaupskil owned 57.41% and the Icelandic state 13%. This came as a surprise to the pension funds that had not known of other Kaupthing negotiations. “This was just business,” a representative of one of the funds said to me, indicating that there had been no hard feelings. Yet, both he and others I have talked to felt that Kaupthing had fooled the pension funds. The result was a breach of trust, seen from the pension funds’ perspective. Arion and Icelandic ministers made much of the fact that new shareholders were now on board, indicating a trust in the bank. Another way to look at it was that these four funds were all previously shareholders in Kaupthing. Therefor, Kaupthing was effectively selling to a part of itself. These transactions between related parties did not bring any new shareholders aboard. The four funds are now both directly and indirectly, through Kaupthing, shareholders in Arion. Part of this transaction between Kaupthing and four of its shareholders was however kept secret: the four funds made an agreement with Kaupthing that should Kaupthing come into possession of shares in Valitor the four funds would have an option on the Valitor shares. Since this agreement, all moves by Kaupthing and the four new Arion shareholders have been aimed at bringing this to fruition, i.e. that Kaupthing would come to possess Valitor shares, which the funds would then buy. Buying Valitor in a transparent normal sale, competing for this asset with other buyers, was apparently never part of the plan. Why this interest in Valitor? Over half of Valitor’s earnings comes from its foreign operations, it has some clever technical solutions and operates in a market the foreign funds understand well. Therefor, the funds are well positioned to make the most of this asset in a future sale. According to Icelog sources Valitor’s value is easily twice p/b. In January this year, Kaupthing approached some Icelandic pension funds with an offer to buy up to 5% in Arion. The deadline was 12 February, two days before Arion’s annual accounts were due to be published. One Icelog source said that late in the day, the foreign funds had realised that in Iceland you can’t do any major deal without having some of the pension funds on board: their money is useful but most of all, transactions are lacklustre if the pension funds don’t give their blessing by participating. And in this case, selling before a planned IPO later this year would give an indication of price and interest. It soon became apparent that the pension funds were not too keen to accept the offer and in the end none of them agreed to buy. The reasons given varied: the time was too short, they would have liked to see the annual accounts first, they felt the present major shareholders had an unclear vision of the bank’s future. – But underneath, there was still the lingering rancour from the abruptly ended negotiations last year. Then, lo and behold, the story turned out to an entirely different one: Kaupthing did (of course!) have a plan B, in case the pension funds rejected the offer. The story from last year was repeated: within 24 hours of the lapsed deadline, Kaupthing announced a sale of just over 5%: four Icelandic investment funds, managed by four Icelandic banks, materialised as buyers of 2.54%, with Attestor Capital and Goldman Sachs, buying in total 2.8%. The four funds, i.e. the new Icelandic shareholders, are managed by Kvika, which is also Kaupthing’s advisor, Stefnir managed by Arion, where Kaupthing is the largest owner, Landsbréf by Landsbankinn and Íslandssjóðir by Íslandsbanki. The share division between the individual buyers has not been announced. As one Icelog source said this was worse than anticipated in the sense that it only brings a very small amount of new owners in Arion and again, the Kaupthing-related Valitor-interested funds are participating. From this point, the plot thickens. The 5% sale was crucial since the Arion board had agreed at its meeting 12 February that a sale of 5% of Arion shares was needed to unleash a dividend of ISK25bn. It also agreed to allow Arion to buy up to 10% of its own shares, a transaction that would then be deducted from the dividend. The representative of the Icelandic state on the Arion board voted both against linking dividend payment to other transactions and against Arion buying own shares, both of which ran counter to the government’s ownership policy. The Arion board, controlled by Kaupthing, however had its way here, i.e. the dividends are connected to other transactions and Arion could buy own shares. The share-buying sounds particularly ominous in Icelandic ears since this characterised the boom-time banking in Iceland. Following the board meeting two things happened: Arion bought 9.95% of its own shares from Kaupthing (via Kaupskil) – and Kaupthing (via Kaupskil) made use of its option since 2009, buying the state’s 13% stake in Arion. This means that the Icelandic state will have no say, neither on the board or elsewhere, over Arion. Alors, all hindrance out of the road to Valitor. In principle, this should be a good move; the state was only ever an involuntary shareholder. It owns quite enough of the financial sector, owning the two other big banks, Íslandsbanki and Landsbankinn. – However, given that this is being orchestrated by Kaupthing adds an unsettling feel to the sale. Dividend in kind is another thing that has a particular ominous echo in Iceland, both from the boom years and also from some transactions in the last few years. The experience in Iceland is that this has mostly been done in order to tunnel assets to major shareholders, in effect cheating other shareholders and creditors. Tunnelling played a large part in the transition in Russia and Eastern Europe, a rather inglorious comparison. And how many systemically important banks in Europe pay out dividend in assets? In an interview I did for Rúv in January with deputy director of FME, Jón Þór Sturluson, he emphasised there is nothing illegal in this. He did however point out that it is a doubtful action since estimating the value of a payment-in-kind may cause problems. And in particular, it causes reputational damage. Strong words when they come from the regulator but, according to some of my sources, not strong enough. This is a serious issue since Arion is a systemic important bank. Thousands of Icelanders, Arion clients, are stakeholders. Given that Valitor is one of Arion’s most valuable assets, distributing it with a secret agreement attached instead of selling it, gives the transaction a sense of tunnelling out valuable assets to preferred shareholders before the IPO. It has not yet happen but it is expected to be imminent. Sources connected to Arion tell Icelog that Valitor might be worth more in the hands of experts such as the foreign funds. That is correct but handing Valitor over to Arion shareholders instead of selling to highest bidder seems far from being evenhanded. Sadly, it is a repetition of events seen in the last few years. The sale of Bakkavor, by Arion, and of Borgun, by Landsbanki both had a foul smell of friendly favours. According to minister of finance Bjarni Benediktsson, leader of the Independence party, agreements between the state and Kaupthing hinder that assets would be tunnelled out of the bank. So far, it has clearly not been the case that the agreement secures some governmental oversight via the Kaupskil set-up. The most active Kaupthing creditors now rule the bank. There has been some discussion in Iceland if the price for the Arion shares taken over by Kaupthing is the right price. To my mind, that is not the main issue – the main issue is how the Kaupthing creditors have manipulated events in Arion so far. If they achieve their goal of getting Valitor without bidding for it is the proof that the agreement was not worth much. The intriguing thing is also that Benedikt Gíslason, who was the government’s main advisor in reaching the agreement with creditors in 2015, is now working for Kaupthing. All of this is happening in broad daylight – and Icelanders have seen tunnelling before. Now it’s being done together with foreign investors. Iceland is tiny and often beyond the horizon of international media but the IMF comments last year underline the gravity of these matters. An IMF is due to visit Iceland now in March. Just in time to evaluate how Icelandic authorities are doing on the Arion test. Special-interest billionaire-funded organisations have for years been a common feature in US politics but less prominent in the UK. The UK Legatum Institute, now influential in pro-Brexit government quarters, seems to fit the US formula. It played a curious role in an Icelandic dispute in 2016 with some US funds holding offshore króna. That story throws an unflattering light on Legatum’s research and exposes intriguing US connections. In a wider context it is a cause for concern that sponsors of British charities can hide behind the offshore veil. In October 2016 the Icelandic government suddenly found itself the target of an international ad campaign. With a photo of Central Bank governor Már Guðmundsson the Icelandic Central Bank was accused of corruption. The government was said to follow “protectionist economic policies” discriminating against offshore króna investors, in reality four American funds. Not a word on the fact that the policy of the Icelandic government was formed in close cooperation with the International Monetary Fund. The ads ran in international media like the Financial Times, WSJ and Danish media, in addition to Icelandic media. The ads were signed by “Iceland Watch,” run by Institute for Liberty, which claimed to be a think tank. One of the ads cited “a research team in Britain” that claimed the action against the offshore króna investors cost each Icelander between $15,000 and $27,000 a year, causing the loss of 30,000 jobs, quite fantastical figures in the context of the Icelandic economy. These findings were taken from a report, Frozen Capital: a Case Study of Icelandic Distortions by Shanker A. Singham and A. Molly Kiniry at the Legatum Institute. Now that Legatum’s staff is publishing Brexit reports and popping up as Brexit-advisers in Whitehall Legatum’s Icelandic report and the ties it shows throws an interesting light on the Institute’s operations. Until the ads appeared, Institute of Liberty and its Iceland Watch had been wholly unknown in Iceland. Institute of Liberty was however a familiar name in US politics. In her book, Dark Money; The Hidden History of the Billionaires Behind the Rise of the Radical Right, the American journalist Jane Mayer recounts how billionaires like David, Charles and Bill Koch, Peter Singer and lately Richard Mercer, much strengthened by the 2010 Citizens United ruling, have poured money into politics for decades, inter alia advocating in favour of tobacco and petro-interests and against Barack Obama’s healthcare. DCI turned out to be instrumental in spreading funds to groups fighting Obamacare, some of which, according to Mayer, “appeared to be shell organizations fronting for DCI Group.” One of them was Institute for Liberty. As a recent Bloomberg story (with a link to Icelog) shows the DCI Group’s operations are essentially lobbying in disguise, greased by ample funds from opaque sources. “Who is paying for public corruption and discriminating rules in Iceland? You do! The decision taken by the Central Bank of Iceland to discriminate between investors so that only those of domestic origin can invest there has been criticised internationally. According to a new study done by a research team in Britain the discriminatory policy of the Icelandic capital control hinders the creation of 30.000 new jobs and costs the nation between 5.000.000.000 and 9.000.000.000 US dollars in GDP annually. In the context of the Icelandic economy these figures are rather implausible. How could offshore króna controls hinder the creation of 30.000 jobs in an economy with close to full employment in a country of 332.000? The stated cost of $5bn to $9bn amounted at the time to 25 to 40% of Icelandic GDP. – In short, the figures were outrageously unintelligent. My own inquiry at the time showed that the DCI Group orchestrated the Iceland Watch ad campaign in autumn 2016 on behalf of three of the four American funds that held Icelandic offshore króna – Autonomy Capital, Eaton Vance and Discovery Capital Management. My understanding was that DCI, on behalf of the funds, had turned to the Institute of Liberty, i.e. the initiative came from the DCI, just as it had used Institute of Liberty and other organisations in fighting Obamacare. The Legatum report on the Icelandic offshore króna was remarkably unenlightened but had, for obvious reasons, a rather limited effect. A Legatum report in November last year on Brexit, The Brexit Inflection Point; the Pathway to Prosperity, by Singham, Radomir Tylecote and Victoria Hewson is a different matter, dealing not with a minor matter in a liliputian nation but the a vital issue for a rather bigger nation and 27 other European countries. The November report was not the first Brexit report from Legatum but it caught much greater attention than the earlier ones because by November, the British media had become aware of Legatum’s role in Westminster. Some journalists who gave it a close reading were less than impressed. FT’s Martin Sandbu wrote of “Beware the global Britain con trick.” In the same paper, Martin Wolf wrote on “Six impossible notions about “Global Britain” referring to the White Queen in C.L. Lewis book Through the Looking Glass who claimed to believe six impossible things before breakfast. Singham published an answer to Wolf’s article on CapX and a shorter version in The Telegraph, £) but ignored other critics. Earlier Brexit-related reports were Mutual Interests: How the UK and EU can resolve the Irish border issue after Brexit published in September 2017. The point that caught media attention was that the border issue could be solved by technology; a claim that proved short-lived. In April there was a report on A new UK/EU relationship in financial services – A bilateral regulatory partnership. Two reports papers in February dealt with the negotiations and trade, Brexit: World Trade Organisation Process and Negotiation of Free Trade Agreements and Brexit, Movement of Goods and the Supply Chain. In November 2016 a report dealt with the Cost of EEA Membership for UK Briefing. All reports were written by Singham, mostly in cooperation with other Legatum staff. The general tone is the one of the same kind of impossibility that Martin Wolf pointed out. At the Legatum Institute its main Brexit expert, Shanker Singham has the titles Chair, Special Trade Commission and Director of Economic Policy and Prosperity Studies. In the summer of 2015, Singham incorporated Competere Limited with 1,000 GBP in the UK. A year later the company was in deficit of just over £17,000. Together with a Washington lobby group, Transnational Strategy Group and EPPA Brussel, Competere has set up a Brexit “practice group.” TSG claims to be a “boutique international business and foreign policy consultancy focused exclusively on achieving real results for clients.” EPPA claims to be a consultancy for “creating a constructive dialogue with policy-makers” elaborated with a quote from FT’s Martin Wolf: “We need a balance between markets and governments.” EPPA does not seem to flag the cooperation with TSG and Competere on its website (at least not within easy sight). Singham, who has a dual UK US citizenship, worked at Squire Sanders, a US law firm from 1995 to 2013. Since April last year Michael Cohen, president Donald Trump’s personal lawyer has had a strategic alliance with Squire Sanders, now Squire Patton Bogs. Cohen is one of many in Trump’s inner circle with alleged ties to Russia and Russia’s president Vladimir Putin. Singham’s co-author on the Brexit report in November, Radomir Tylecote, was active on the Vote Leave campaign before the 2016 referendum as was Victoria Hewson, the third author of the report. Molly Kiniry, Singham’s co-author on the Icelandic report and other Legatum publications, is also listed as a consultant with Competere since 2016, earlier at Babson Global. She writes regularly for Daily Telegraph, where two of her recent columns dealt with “The virtue-signalling British Politicians snubbing Trump are embarrassing themselves” and “Americans are sick of sending money to other countries for no discernible benefit.” – The connection with Daily Telegraph is interesting given that the paper is owned by the Barclay brothers, two Brexiters with their wealth firmly offshore. Former Chief Executive of the Vote Leave campaign Matthew Elliott, now a frequent voice in the British media, is a Legatum senior fellow. Georgiana Bristol, Legatum’s Corporate Membership Director, ran fundraising for Vote Leave. Two well-known names from UK politics have recently joined the Institute as Fellows: the fervent Brexiter ex-MP for Labour Gisela Stuart and Sir Oliver Letwin and MP. He voted remain, was briefly in charge of Brexit after the 2016 referendum before being replaced by David Davis by Theresa May and has been seen as a Tory intellectual close to libertarian ideas. An ex-Legatum employee is already a Whitehall Brexit-insider: Crawford Falconer, who was on Singham’s trade commission at the Legatum Institute, is working as a Brexit negotiator under International Trade Secretary Liam Fox. Legatum’s CEO Baroness Stroud has in the past made some unsuccessful attempts to be chosen as a Conservative Party candidate. She set up the Centre for Social Justice in 2004 with Ian Duncan Smith for whom she acted as a specialist adviser 2010 to 2015 at the Department for Work and Pensions. Stephen Brien, who leads Centre for Metrics at the Legatum is on the board of CSJ and was also Duncan Smith’s adviser, 2011 to 2013. Legatum and CSJ have had some collaboration. In 2015 the Legatum Institute organised some events on corruption chaired by Anne Applebaum, i.a. one where she interviewed Sarah Chayes on her book Thieves of State: Why Corruption Threatens Global Security. It was at that time I first noticed Legatum. I welcomed Legatum’s focus and the clout and eminent experience that Anne Applebaum brought to the Institute as its director of Transitions Forum 2011 to 2015, focusing on new threats to democracy. Judging from Legatum’s website the Transitions Forum no longer exists. Applebaum is now Professor in Practice at LSE’s Institute of Global Affairs where she leads Arena, a programme on the challenges of disinformation. Legatum’s expanding role in Westminster has drawn media attention. A whole-page FT article in December 2017 on “Legatum: the think tank at intellectual heart of “hard” Brexit” claims the focus of Legatum shifted in autumn of 2016 when Baroness Stroud became a director and a trustee. Former employees, said to be worried about the direction taken by the Baroness talked of purges. According to them, the organisation seemed to use its influence in Westminster “to push for a libertarian and socially conservative agenda that goes beyond its educational remit as a charity emphasising “prosperity and human flourishing”.” The question posed was if Legatum’s activities were compatible with its status as a charity. FT mentions that Brexit minister David Davis has taken fees from Legatum. That was however in 2009 and 2010, according to They Work For You: £5000 for a speech and, interestingly, unspecified travel expenses to attend a conference at the Milken Institute that attracts those with libertarian leaning. According to information on They Work for You neither Michael Gove, Boris Johnson nor Liam Fox have accepted funds from Legatum. Davis gave however a talk at a Legatum Brexit event in January 2017, Gove was a guest speaker at the Legatum’s summer party in 2016 (according to Legatum’s 2016 annual accounts); neither seems to have been paid for their input according to the They Work For You data. In late November Daily Mail published an article on Legatum’s political connections, ‘Putin’s Link to Boris and Gove’s Brexit Coup’. According to the paper, Singham had helped two Cabinet members, Boris Johnson and Michael Gove, to pen a letter to Prime Minister Theresa May. In the letter, not meant for publication, the duo called on May to put pressure on Chancellor Philip Hammond to prepare for “hard” Brexit, to use Brexit to scrap EU rules and regulations and to appoint a new “Brexit Tsar.” No Tsar has officially been appointed but the tabloid maintains that Singham effectively has that role. Daily Mail pointed out that Legatum’s founder Christopher Chandler and his brother Richard got rich in Russia following the collapse of the Soviet Union. The tabloid tells the story of the brothers taking part in a boardroom coup in Gazprom in 2000, installing Alexey Miller, close ally of Vladimir Putin from their St Petersburg years. This enabled Putin getting a share in Gazprom’s profit. Chandler and the Legatum Institute deny all allegations of Russian ties and also denied allegations made by The Sunday Times and Sunday Mail in early December regarding its status as a charity. Legatum Group (legatum.com) is based in Dubai where it was set up in 2006 by Christopher Chandler. It describes him as former President of Sovereign Asset Management he set up in 1986 with no mention of his earlier Russian activities. Its website lists a whole raft of philanthropic organisations under its umbrella, the Legatum Institute being one of them. The Legatum Institute’s own website is somewhat vague on the Institute’s funding. Under the heading “How we are funded” there is a list of four other philanthropic enterprises, funded by the Legatum Foundation (legatum.org), also listed under Legatum.com, but the link attached leads only to a website with the four enterprises. There are two relevant Legatum entities listed with Companies House, The Legatum Institute Foundation, which is the registered limited company operating in London and the Legatum Institute, a fund registered in the Cayman Islands. The accounts do not hold any information on the real sponsor, Legatum Foundation Limited nor is it registered in the UK, judging from Companies House. The Legatum Institute Foundation has confirmed it will fund the Institute until end of 2019. As can be seen from the above figures there is still some funding to cover to match the Foundation’s funding. According to the FT the charity has 40 donors in addition to its lead sponsors, but interestingly the charity is unwilling to disclose who these donors are – a peculiar situation for a charity. Christopher Chandler and Mark Stoleson have recently obtained EU passports through the widely criticised Maltese passport-for-investment scheme. Intriguingly, Legatum’s founder and main sponsor fits the model of the American billionaires who for decades have been funding make-believe institutions to influence politics and confuse public debate. Christopher Chandler keeps firmly out of the limelight and his name off documents: people working from him are directors of his companies. The array of Legatum entities, on- and offshore, is rather bewildering and runs contrary to the transparency that charities could be expected to adhere to. There are indications that some of those fighting for Brexit are inspired by Russian and American ideas of how to gain power by dividing and ruling, by sowing disharmony. The Kremlin propaganda machine is inspired by Vladimir Putin’s longtime political technologist Vladimir Surkov and his ideas of “non-linear wars” and other means of profiting from confusion and shifting alliances. Paul Manafort, Trump’s campaign manager, has been indicted with conspiracy against the US, tax evasion and money laundering, as part of the investigations into Russian collusion in the US presidential elections. The Ukrainian journalist and politician Serhiy Leshchenko has explained how Manafort operated in Ukraine by putting into practice the politics of division and social polarisation. There is of course nothing wrong with airing one’s views. But airing it on false premises is insidious and undermines public debate. And false or biased information is one way of playing the politics of division. As Jane Mayer describes so well in her book, key strategy of billionaires is to fund organisations that produce something that looks like “research” but is indeed propaganda. This has been an effective strategy in fighting for the interests of the tobacco industry and the petro-industry, not to mention Obamacare. The damage is done when the media embraces this research as equally valid to thoroughly researched material. The danger is media unwilling to or uninterested in distinguishing between the propaganda and carefully researched studies. Another aspect of the propaganda-driven organisations is the opacity of their sponsors, normally offshored and out of sight. The offshoring should indeed be a sure sign of warning. These propaganda organisations have so far not been prominent in the UK. Legatum Institute, funded by Christopher Chandler, seems to fit the US model of a propaganda-driven “think tank.” Thus, their reports should be read with that in mind. The two reports, on Iceland and Brexit, certainly seem a poor addition to an enlightened discourse on these two topics. * I pointed these figures out to a Legatum employee who forwarded them to Singham. His response was that the data was “based on the application of our ACMD productivity simulator (for more information, please see the attached link).” He agreed I made a valid points regarding the employment effects and Iceland’s small size. Consequently, they would “probably … not focus on employment effects too much in the deeper analysis. While capital controls are generally distortionary from the perspective of an open and liberalized trading environment, the precise manner of their amendment or repeal also can have distortionary effects. The data is picking up the implicit national treatment violation as a function of the key variables on property rights and foreign investment in our simulator.” – The analysis on the website is still as it originally was, with the implausible figures. **According to Companies House records 8 March 2018, the Cayman fund is now in administration.